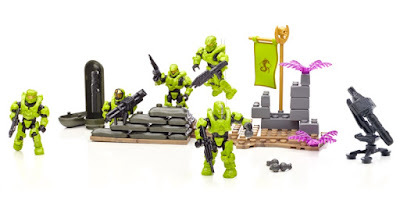 Returning with another look at a MEGA Bloks Halo set, we've called in the troops for a full frontal assault. Nobody likes to go into battle alone, which is why its nice to know your Spartan brothers have got your back... in very snazzy armour. We review the UNSC Fireteam Vemon Battlepack. The battlepacks are essentially multiple figure packs which also contain all the weapons your guys could need, and some awesome terrain to play on and pose upon. The UNSC Fireteam Vemon Battlepack contains five micro action figures, a tonne of weapons and accessories, an artillery piece, a drop pod, and a couple dozen bricks to make up the terrain. And, crucially, all this comes in at a very reasonable price. Lets take a closer look shall we? The first thing that struck us about the set was just how much you actually get. We've written before about individual figure packs (such as the Charlie Series and the Metallic Series), but with the UNSC Fireteam Vemon Battlepack you get a lot more bang for your buck. As you can see from the photo above, all five figures will comfortably stand on the included terrain piece, allowing you to create a great ensemble pose - like a sports team ready for the big game. But more importantly, all those figures are not the same. You get five different kinds of Spartan warrior here, each with unique armour and helmet designs. Included is (from L to R) a Spartan Oceanic, a Spartan Aviator, a Spartan Scout, a Spartan Gungnir, and a Spartan Enforcer. Each figure is massively posable, and for a full run-down of their articulation check out our Charlie Series review mentioned above. Check out that armour. Unlike the figures we've previously reviewed, even the bright red Spartan Protector from the Scorpion's Sting set, the Vemon boys really stand out. The lime green plastic is speckled with patches of darker green, creating a battered and well-worn effect. You'd think soldiers in bright green armour would look a bit silly, but these guys look uniquely mean. The gold paint on each of the visors is nicely applied too, adding another layer of detail and realism. Here the Spartan Oceanic has a nice and intricate paint job around his visor, with the dark blue grill matching perfectly the colour of the figure under the green armour. We decided to set this guy with the largest weapon accessory, a rocket launcher. Included also with the firearms are five or six frag grenades, giving the figures' other hands something to grip. And once all his rockets are fired and the grenades have been thrown, the Spartan can also launch the missile pod, complete with tripod. This is a nice addition to the set which can either be positioned directly onto the studs of the terrain, or set aside. The missile section itself can be lifted off from the tripod, and with the addition of two included clips, can be wielded by a figure. Heavy job, we imagine. The terrain section is pretty nifty, containing a nice mix of brick-like blocks and sandbags. There are also two purple plants (which contrast against the green armour of the troops nicely), a flag pole and banner displaying the team's symbol, and the weapons drop pod. It took about five minutes to assemble and gives a lot of good pieces which can be taken apart and used for other terrain sets. Don't like the layout as it comes? Simply rebuild one yourself. We especially like the sandbags which both look authentic, and can be easily reassembled. Crack open the drop pod and you'll find the rest of your weapons cache. In terms of play this could be used to deliver vital bits to your troops in the nick of time, but as a display piece it serves to store all the parts you're not currently using in your set up. Another feature of the terrain is this transparent rod with a clip at the top. It can be used to slot into the hole on the back of each figure and elevate them in a dramatic pose. This could either be as part of a heroic leap into the fray, or as an explosion blasting the figure into the air. Whatever you want to use it as, its a nice additional part and adds another layer to your positioning possibilities. Don't like it? Just pull it out and hide it somewhere. And yes, that banner can be disconnected and held by a figure. Makes you all patriotic, doesn't it? If you're a member of Venom team, we assume. Still, it represents another nice possibility in posing the troops on the base. Using the terrain pieces to pose the figures is a great reminder of just how articulated these guys are. Thanks to possessing joints in both the knee and hip, a figure can be arranged on different heights of terrain, further adding to the sense of realism. Because if this the Spartans can be arranged standing on the brick blocks and the sandbags, as well having a foot placed off of the base altogether. And let's face it: a group of tooled-up futuristic warriors are always going to look cool standing together, poised for action. 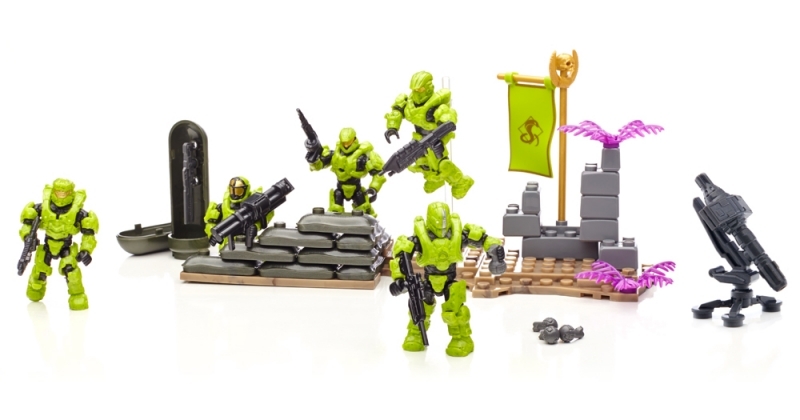 That's the reason we really love this set, maybe more so than any other MEGA Bloks Halo set we've reviewed so far. 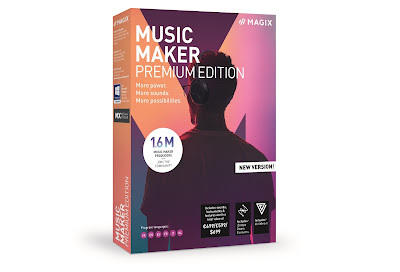 Yes, the kids are getting a tonne of great stuff to play with, but the older collectors are getting something that can be posed and displayed on a shelf in a multitude of ways. If you're looking to bolster your Halo Spartan ranks, this is an excellent, and cost effective, way to do it.